The new VIPER-LED memory series has been designed to focus on its progress for unprecedented performance and has been built and tested for the latest platform, and the new VIPER LED series adds some features to the most demanding environments of gaming-dedicated computer boxes, The new unit series comes with high-glow LED lighting to give an elegant aesthetic touch, with a distinctive design of the elegant thermal cover made of aluminum, the series of VIPER Led DDR4 memory modules have been optimized to provide maximum performance for the leading motherboards series ( Intel 100/200/300 and also for the AMD 300 series, the VIPER LED series is available in both the red and white colors of the LED lighting model, which lighting gameplay tools with bright, integrated lighting, designed to make gaming tools look distinctive in their appearance as high performance. 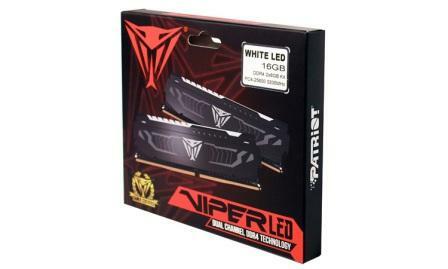 The hardware boxes for gaming are characterized by many features, such as large windows, and side panes made of glass-tempered, what is an ideal complement to these systems is a well-designed lighting scheme, which includes LED lights on all major ingredients, and a series is available The new memory modules VIPER Led DDR4 with a red and white LED lighting with a distinctive decorative style and a very cool brightness. In addition, each unique module of the VIPER LED memory series DDR4 has been built on a 10-tier printed circuit board, which ensures the integrity of the signal good for stable games and performance of high frequency playback, the slides and ICs chips located in the VIPER led DDR4 series under strict quality control, and humiliation K to maintain a steady reliability, raise an excellent playback frequency on the motherboard series (Intel 100/200/300), as well as AMD motherboard 300 platforms.